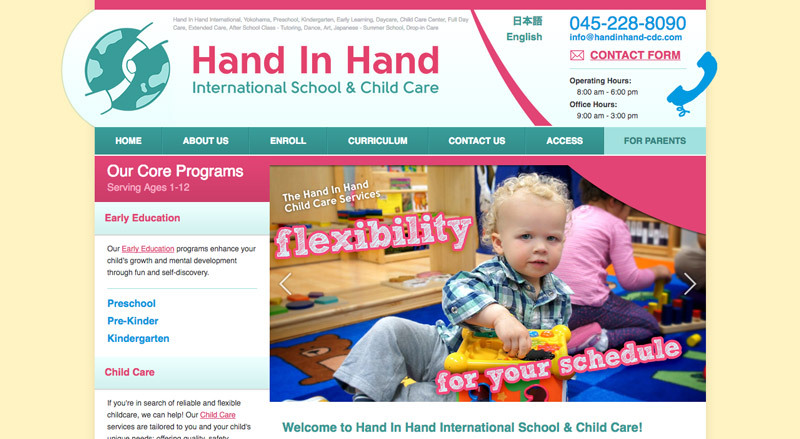 Hand in Hand is an international school located in Yokohama, Japan. They provide English language education for Japanese and International families from ages 1-12. Their website serves as a platform to generate leads, as well as inform parents of information about Hand in Hand’s operations. Their name and logo represent the helping hand that leads their students from one stage of life to the next, an ethos that exists throughout their brand. Hand in Hand wanted to create a more impactful and memorable logo with Humble Bunny while maintaining the “hands” and “globe” concepts from their previous logo. We worked together with various design directions, revising and improving the design until we reached the final result. The final logo design implements one hand leading another hand in front of a globe, representing how Hand in Hand guides its students from one stage of life to the next. It was designed to be professional, yet cute, and emit a sense of trust and guidance to the viewer. Hand in Hand first approached Humble Bunny in need of a new logo, design language, and website. After the initial proposal process, we took a deeper look into their existing brand and content, finding ways to improve and build upon it for the latest version. First, we combed over their existing website and auxiliary content, organized it accordingly, and developed a branding strategy to highlight these aspects accordingly. We had to develop a design language that was western oriented, yet maintained the “cuteness” of Japanese culture while maintaining a professional appearance. Complementary colors were chosen and modified so that the color scheme felt professional, yet friendly and approachable. The result was an overall design that was light and colorful, yet not too loud to be seen as immature or too childish. Typography was also modified to better carry the playful yet professional image that Hand in Hand requested. The logo has a playful, younger, font while the content typography is more structured and classic. This allows the site to appear welcoming and playful without sacrificing professionalism. After the logo, color scheme, and design language were confirmed, we implemented these aspects into their website. Using their existing sitemap and content plans, we consulted with Hand in Hand on where to make improvements for the best presentation. In addition to implementing color schemes and logos, we also developed custom illustrations for each line of classes, making information easily available and easily distinguishable to website visitors. After revisions and implementation were completed, the website was launched. It is still actively used by Hand in Hand as a lead generating tool, as well as an informational resource for prospective and current parents. We gave deeper insights into their company than just the logo and design, for the sake of providing our clients with all the tools they need to be successful.